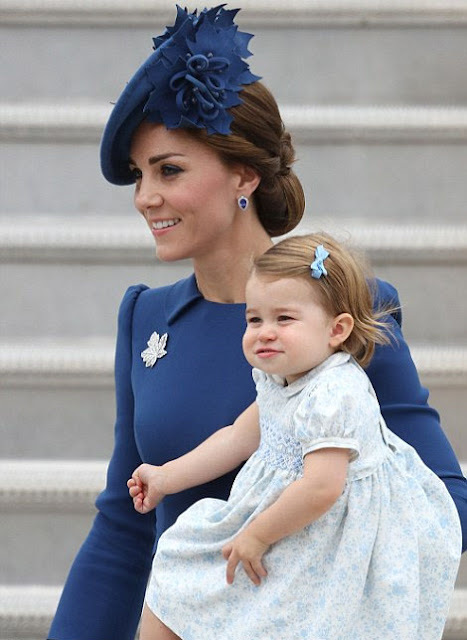 Kate and Princess Charlotte in Canada. Getty Images photo. 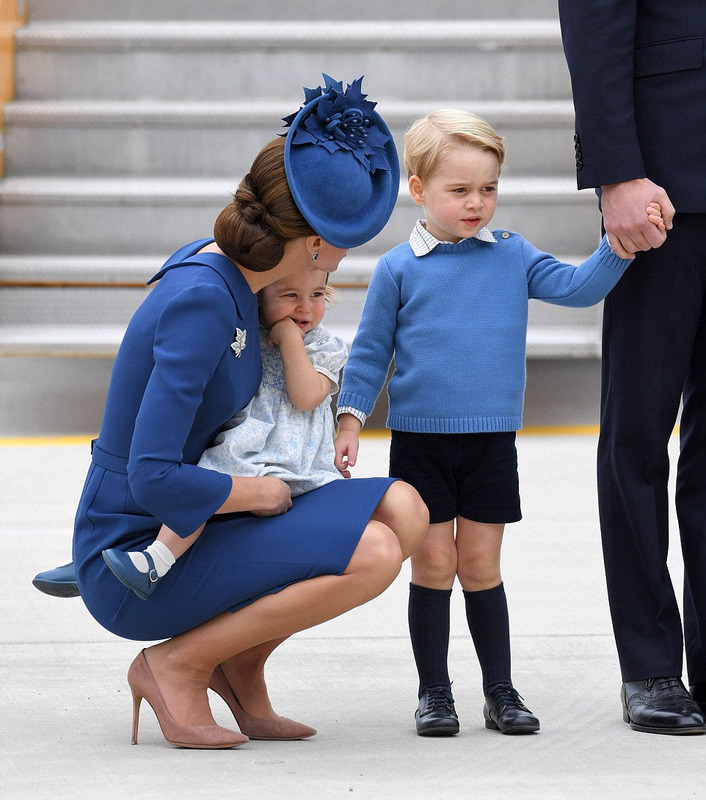 The Duke and Duchess of Cambridge are on tour in Canada with their children at the moment and Kate kicked off the journey with some great jewelry. Her Maple Leaf diamond brooch by Asprey is on loan from the Queen, and her earrings, in tanzanite and diamond, are from G. Collins & Sons. Quite nice! Some of her sartorial choices of late have begun to worry me, though this ensemble seems tasteful and appropriate. Does it also seem…too old for her? It is hard to remember she is just 34 when I see these pictures. Do you think the jewelry is responsible for that, or is it the dress, hair or hat? I would love to hear your thoughts on this! Also, do you think William and Kate call their daughter Little Char-Char from time to time? I certainly hope so. I hear that’s what other parents of girls named Charlotte do! William and Catherine and Kids arrive in Canada. Reuters photo. I have to say, I am impressed with Kate’s high heels skills. 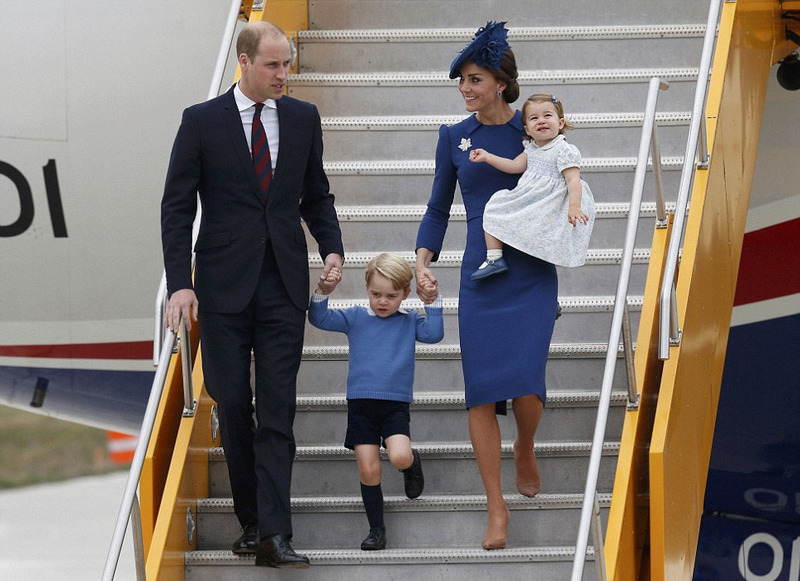 Plane steps, toddler in arms, and holding the hand of an unpredictable three-year old, all at the same time? And stays upright in what look to be 3 1/2 to 4 inch heels? Amazing. Nice shot detailing the hat, hair and dress. Maybe she is giving George a pep talk to be good! Wireimage photo. Kate wears the Maple Leaf brooch by Asprey, on loan from the Queen! Photo by Reuters. I was excited to find out that Bunny Mellon’s collection of Jean Schlumberger jewelry and objects will be on display at the Virginia Museum of Fine Arts in Richmond starting February 11, 2017. Woo hoo! I hope I get a chance to visit it. 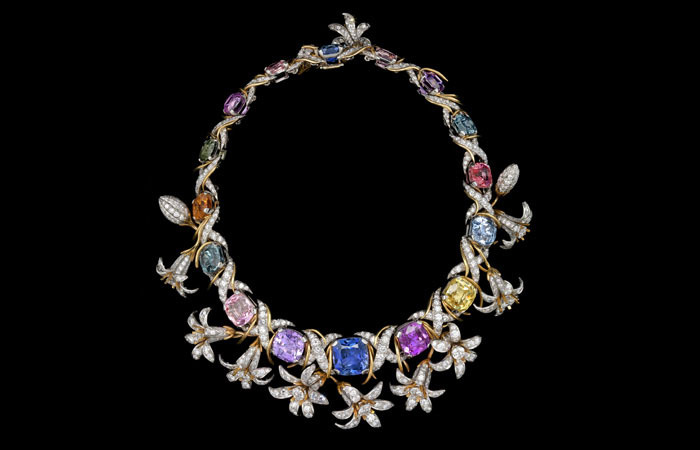 The further down the jewelry rabbit hole I go, the more I love the vision, wit, color, design details, and craftsmanship of the incomparable Jean Schlumberger (1907-1987), who became the chief designer at Tiffany & Co. in 1956. This necklace is his “Jasmine (Breath of Spring)” from 1966 of 18k gold, platinum, colored sapphires, and diamonds that Bunny owned. It is divine! Some of the objects that will be included in the exhibit were made to her specifications. What can be better than bespoke Schlumberger? I think that must be about as rich as it gets. You can read more about the exhibit here. A Schlumberger “Jasmine (Breath of Spring)” necklace from the collection of Bunny Mellon. Let the weeping begin! Love this J. Crew ad featuring a look with a neckerchief! J. 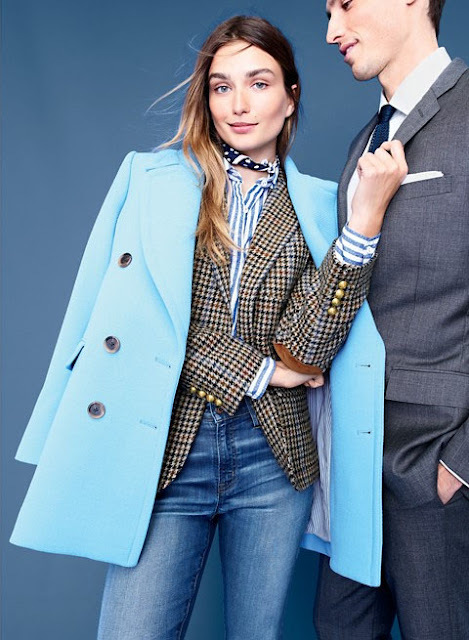 Crew has some really great items in their Fall 2016 catalog and I particularly liked this photo of a model wearing a striped shirt, houndstooth blazer, pale blue coat, and a neckerchief! I think the neckerchief (or bandana, if you prefer), is such a perfect transitional accessory for early fall. 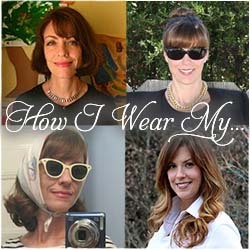 Don’t forget October’s “How I Wear My” is devoted to it! Send pictures to us at howiwearmy@yahoo.com by October 3, 2016. Let me know what’s on YOUR mind these days! And do chime in about Kate. Or Bunny! Or J. Crew! 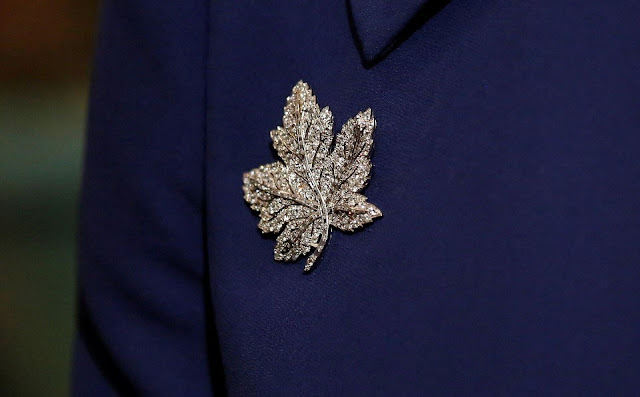 I read Hostess of the Humble Bungalow reporting that the Maple Leaf brooch was actually a gift from Canada to the Queen Mum way back when. My Dear Jill, we defer to you on all matters precious metal/stone but when it comes to advising stylish women dressing for a special occasion, those matters are best left in the strong, attentive hands of GSL. Hi GSL, I think Hostess got it wrong re the brooch. I have read in more than one place that it was a gift to the Queen Mother (when she was a Queen herself) from her husband in 1939. I don't know why you persist in insulting me on my own blog but I kindly ask you to stop. Jill, there was no insult intended as It Girl certainly wasn't intended at you personally but rather those Fashionista PYTs no doubt populating your neighborhood. I thought it would be universally obvious It Girl applies to the under 25 set. The chiding tone was something I didnt5 realize you now take as insult. I shall trouble you no more. I think Jill is correct re the brooch but there are always so many stories about these types of stories that it is very easy for myths to become legend. I am on vacation and have seen snippets and probably the highlights as I am in Asia and the British royal family don't get headlines over here but she did look nice in the red dress. I think she looks like she made an effort to spruce up her image as she has been getting lacklustre press and doesn't always make it to the headlines even on the daily mail. The blue outfit was nice but prescriptive and wasn't really flying the flag for neither the UK nor Canada fashion wise. Those beige heels are high but they have a platform so are about 3/4 inch off the heel. I don't think she will be stir the fashionista hearts and she will just do her own thing but I still stand by that she could do more to champion unknown British designers or other up and coming Commonwealth designers than being seen most of the time in some brands that don't follow any social, economic nor ecological model of any high standard. GSL - She is the future Queen of England but as a Younger royal but I have seen aspiring park slop IT girls fly the fashion flag better with less influence and media coverage. She looked nice and presentable and I thought that the red dress was really nice on her but as someone who doesn't rose tint the royal family and whose tax dollars contribute to the estimate £50 million pounds they will receive despite being one of the wealthiest families in the world, some of us expect better fashion bank for the buck.I appreciate your fashion views but that doesn't negate Jill's fashion perspective which I alway enjoy. Hi! I thought the same thing regarding the Duchess descending the perilously steep stairs in very high heels, with child in arms! No doubt finely honed thighs and advanced heel wearing skill come in handy when you are making an entrance. I think Catherine has to walk a fine line to please everyone with her public wardrobe. I usually enjoy her choices. One exception, a red and white lace McQueen worn earlier this week seemed a bit odd for the time of year,as well as a bit girlish for a work dress. Nevertheless, I enjoy following the royal couple, and wish them the best, as they seem like wonderful people. Thanks, also, for your wonderful posts with exceptional jewelry. Amazing, what's been made to order.